It's my biggest sale ever! Almost everything is on sale and some items have been reduced over 50%. I usually celebrate summer with a Christmas in July sale, but the truth is that I have a hard time thinking about Christmas in July. 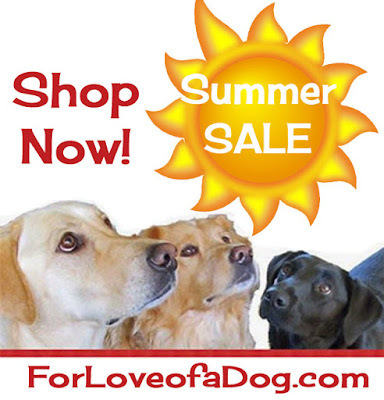 So, I'm calling this a summer sale, though you certainly could pick up some amazing bargains for holiday gifts at For Love of a Dog. This is the first time I've put all of my dog breed jewelry on sale. Yes, all of it. Every single breed. And I should tell you that right now I have less than a dozen of the little dog charms (in various breeds) and there will be no more. Yes, you read that right. So, if I have your favorite dog breed in a piece of jewelry you like, you should snap it up. Now! My rescue and adopt a dog jewelry is on sale. 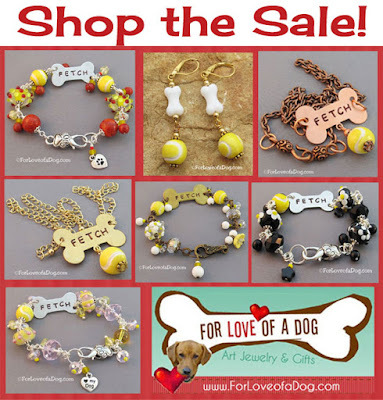 That includes Foster Dog Mom jewelry and Dog Mom jewelry, too. 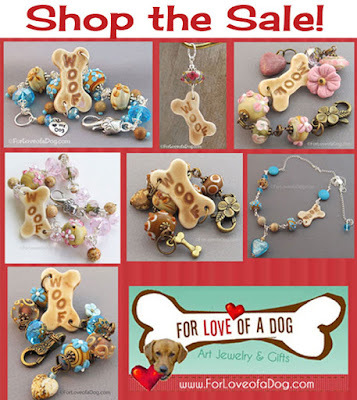 I've slashed my prices on dog leash holders and just have a very few dog breed leash hooks available. 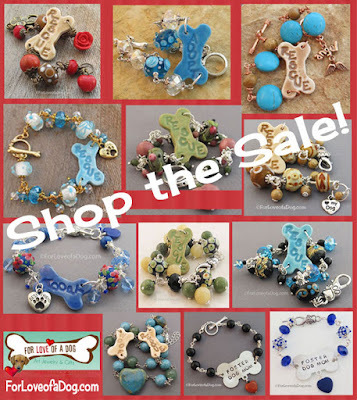 Since it just wouldn't be a real sale without a few barks and woofs, you'll find my Woof dog bone jewelry on sale, too. 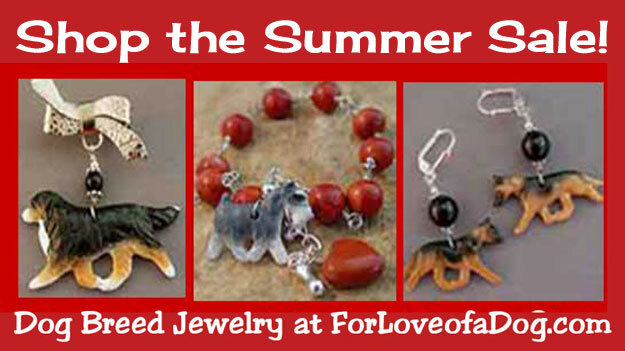 Though you don't see any graphics here, you'll also find cat and horse jewelry included in my summer sale. 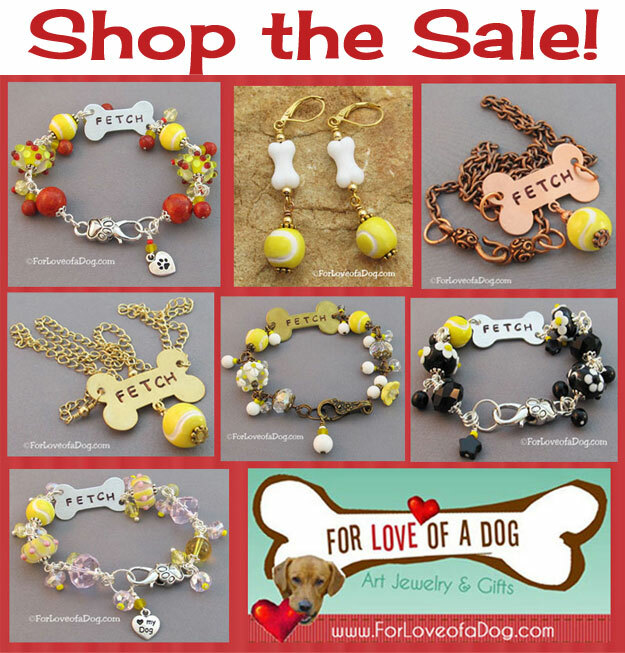 Jeffie, Rudy and Rosie all agreed that my Flyball fetch tennis ball jewelry should be on sale. And yes, all prices include free standard shipping to the US. Hmmm, well the truth is that almost everything is on sale. No lie! In fact, there's so much on sale that you should head to your favorite category because clicking through to the "sale items" will be overwhelming. Remember, almost every item is one of a kind, so when it's gone... it's gone. My best advice: shop now! Wow, did some looking around and that is quite a sale! Good luck with your sale, you have such beautiful stuff. Cool stuff! Hope your sale goes well! I couldn't let 8 photos of happiness slip by without nominating you! Rules are simple. 8 photos of happiness and nominate some other blogs and thank Ariel's little corner of the internet for creating this event.